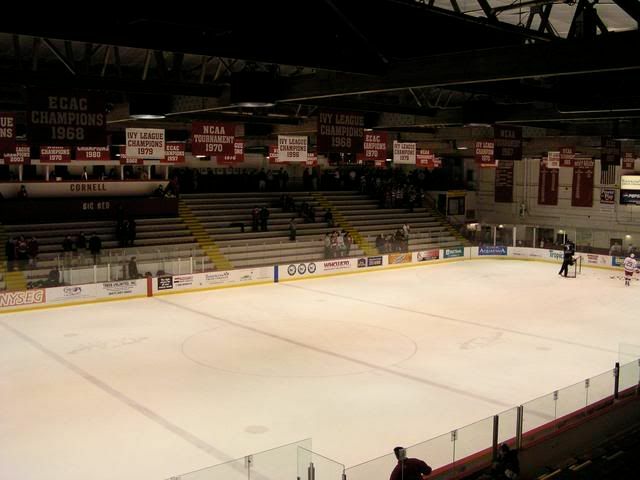 For quite a while, we had been trying to get to a game at Lynah Rink on the campus of Cornell University. It's the closest Division 1 team to Binghamton - but it's wildly popular, and almost impossible to get tickets! The opportunity finally presented itself when Jill got a letter from the RIT alumni association. 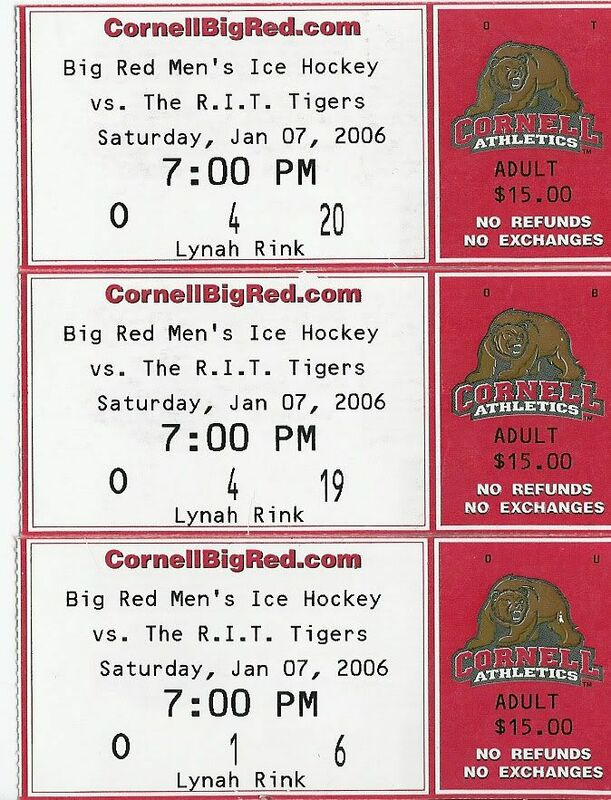 RIT is in their first year of Division 1 play, and were playing a game at Cornell against the Big Red. We couldn't pass up the chance to go to historic Lynah - even if it meant sitting in the dreaded 'Section O'! Of all the rinks we have visited, this one BY FAR had the best atmosphere and fan interaction. A pep band was situated above the student section, and they along with the students led the rest of the crowd in cheers during play stopages and such. The rink has a low ceiling, and seats around 4,000, and when those fans began chanting in unison, it was deafening! RIT played a tough and chippy game, and kept up with Cornell better than we thought they would, but in the end the seasoned Division 1 program was just to much for RIT. An awesome place to watch a game, and somewhere we will definately get back to if the chance ever presents itself again! THE best place to watch a game! SCORING GOALIES PENALTIES 1st Period RIT-Jocelyn Guimond at goalie.................................................... 00:00 COR-McKee, David at goalie....................................................... 00:00 1. RIT-1 Brad Harris (2-HOLDING)..................................... 01:53 1. COR-1 O'Byrne, Ryan/5 (Sawada, Raymond/5;Bitz, Byron/6) [PP]................................... 03:37 2. RIT-2 Steve Pinizzotto (2-CTH ELBOWING)........................... 04:43 2. RIT-1 Simon Lambert/12 (unassisted)............................................................ 09:29 COR-EMPTY NET (goalie pulled).................................................... 18:28 COR-McKee, David at goalie....................................................... 18:32 3. RIT-3 Jesse Newman (2-HOLDING).................................... 18:32 2nd Period 4. COR-1 Bitz, Byron (2-O-INTERFERENCE).............................. 01:55 5. COR-2 Seminoff, Jared (2-SLASHING)................................ 03:33 6. RIT-4 Jesse Newman (2-INTERFERENCE)............................... 07:35 7. RIT-5 Darrell Draper (2-SLASHING)................................. 08:12 3. COR-2 Moulson, Matt/10 (Scott, Topher/10;Bitz, Byron/7) [PP]................................... 09:32 8. COR-3 Pokulok, Sasha (2-SLASHING)................................. 11:01 9. RIT-6 Matt Harris (2-HOLDING)..................................... 14:53 10. RIT-7 Darrell Draper (5-HITTING FROM BEHIND)...................... 18:38 11. RIT-8 Darrell Draper (10-GAME MISCONDUCT)......................... 18:38 3rd Period 12. COR-4 Seminoff, Jared (2-HOLDING)................................. 02:15 13. COR-5 Pokulok, Sasha (2-CROSS-CHECKING)........................... 04:25 14. COR-6 Barlow, Evan (2-O-INTERFERENCE)............................. 07:35 15. RIT-9 Brian Payant (2-HOLDING THE STICK).......................... 09:45 16. RIT-10 Justin Hofstetter (2-INTERFERENCE)......................... 10:41 17. RIT-11 Marc Hyman (2-HOLDING)..................................... 14:35 4. COR-3 Moulson, Matt/11 (Scott, Topher/11;Bitz, Byron/8) [PP]................................... 15:36 18. COR-7 Mugford, Tyler (2-TRIPPING)................................. 17:12 RIT-EMPTY NET (goalie pulled).................................................... 19:02 19. COR-8 Glover, Dan (2-CROSS-CHECKING).............................. 19:19 20. RIT-12 Darren Doherty (2-ROUGHING)................................ 20:00 21. COR-9 McCutcheon, Mark (2-ROUGHING)............................... 20:00 22. RIT-13 Darren Doherty (2-ROUGHING)................................ 20:00 23. COR-10 McCutcheon, Mark (2-ROUGHING).............................. 20:00 24. RIT-14 Darren Doherty (10-GAME MISCONDUCT)........................ 20:00 25. COR-11 McCutcheon, Mark (10-GAME MISCONDUCT)...................... 20:00 26. RIT-15 Brennan Sarazin (2-ROUGHING)............................... 20:00 27. COR-12 Pegoraro, Daniel (2-ROUGHING).............................. 20:00 28. RIT-16 Brennan Sarazin (10-GAME MISCONDUCT)....................... 20:00 29. COR-13 Pegoraro, Daniel (10-GAME MISCONDUCT)...................... 20:00 Win-McKee, David (10-3-2). Loss-Jocelyn Guimond (4-12-2). Game-Winning Goal: COR-Moulson, Matt Penalty shots - None.